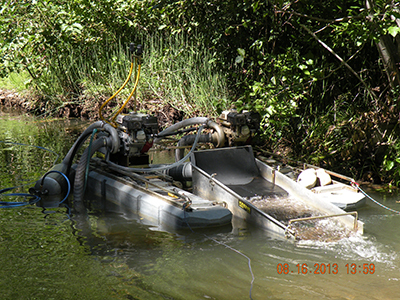 TU is working hard to address a serious problem impacting Washington’s watersheds and threatening the health of our native fish populations: unregulated suction dredge mining and other forms of motorized mineral prospecting. Want to stay in the loop? Sign up here for more information. Suction dredging is a mining method by which the bed of a stream, lake, or river is vacuumed-up and processed through a sluice using a gas-powered motor to search for gold. Once sediment is processed by equipment, it is released back out into the stream or river in a turbid sediment plume. What are the impacts of suction dredging? Proven impacts of these activities include: erosion and sedimentation in streams, which can smother incubating fish eggs and invertebrates; mobilization of mercury and other heavy metals buried in stream sediments; physical impacts to eggs, juvenile fish, invertebrates, and other aquatic organisms that are “processed” by suction dredges; disturbance of riparian vegetation at equipment access points and streamside campsites due to long-term use; and interruption of natural stream form and function and destruction of habitat features. Of the states in the continental U.S. that support the remaining populations of Endangered Species Act (ESA)-listed Pacific salmon and steelhead, Washington is the only one that still allows unpermitted suction dredging and other forms of motorized recreational mineral prospecting. Hundreds of millions of taxpayer dollars have been spent on fish habitat restoration efforts throughout Washington State’s watersheds over the past 20+ years, and suction dredging undermines these efforts by unraveling the beds and banks of streams that are critical to the survival of the native fish species these projects are designed to benefit. Ironically, habitat restoration projects must apply for and receive individual permits from the State (including payment of a permitting fee), while suction dredging operations are not required to get individual permits AND they are exempt from permitting fees. This simply doesn’t make sense! Where is suction dredging occurring? This is not an isolated issue. Suction dredging occurs across Washington State: from the South Fork Nooksack River with its spring Chinook salmon that are on the brink of extinction to the Peshastin Creek watershed near Leavenworth with its steelhead trout that must travel 500 miles and navigate seven dams to return to their spawning waters. The Nooksack River, Skagit River, Skykomish River, Wenatchee River, Yakima River, Ruby Creek, Okanogan River, Upper Columbia River, and Lewis River watersheds are some of the hotspots for suction dredging in Washington. Suction dredgers that have been displaced from other West Coast states due to the recently-tightened regulations have moved into Washington State, creating much greater pressure on our streams and a dangerous situation for our native fish. Virtually all waterways (including coastal beaches) are open for suction dredging, including areas listed as Critical Habitat under the ESA. What are the current suction dredging regulations? 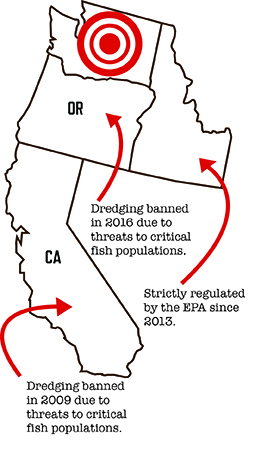 Due to proven impacts to fish habitat caused by suction dredging, California (2009) and Oregon (2016) have banned the activity, and Idaho regulates it strictly under the Clean Water Act (2013). In Washington, however, suction dredgers essentially receive a blank check: there are no fees; no permits required; and no tracking and accountability by the state agency charged with regulating these activities, the Washington Department of Fish and Wildlife (WDFW). Washington allows most suction dredging to occur under the auspices of a blanket statutory rulebook, which operates like a programmatic permit for all recreational mineral prospecting – the “Gold and Fish Pamphlet.” WDFW has limited enforcement authority for violations, and repeat offenses are commonplace. The state does not have ESA “take” coverage from NOAA Fisheries and U.S. Fish and Wildlife for administration of the Gold and Fish Pamphlet, therefore placing itself in a tenuous legal position on this matter. The evident shortcomings of the current regulatory system in Washington demand we improve our regulations to be adequately protective of our native fish and ensure all resource users are being treated equally under the law. A strong and diverse coalition of stakeholders is coalescing around the need to work with law makers on legislation to overhaul suction dredging regulations – please join us to learn more about how you can help!